From the main road turn left after first wood bridge from Banska Bystrica, or if arriving from Ruzomberok turn right before second wood bridge. Then turn second right and second left. The apartment house is situated on the left side near the large hotel. From the main road turn left after first wood bridge from Banska Bystrica, or if arriving from Ruzomberok turn right before second wood bridge. Then turn second right and first left. The apartment house is situated on the right side near the large hotel. We are pleased to welcome you in our apartment houses no. 172 and no.186. The apartment houses are located in the best place in Donovaly. 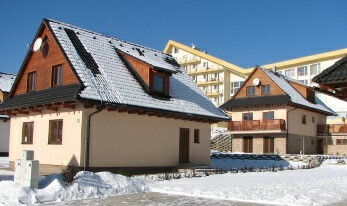 Newly built objects, comfortably furnished, only few metres from ski-lifts is suitable mainly for families. We offer two apartment houses with two separate apartments for 7 people. Each apartment consists out of 2 bedrooms, 1 livingroom, kitchen and a bathroom with toilet. Maximum capacity of one apartment house is 14 people. Next to the houses there is a small wooden summer house with veranda and an outside grill.